Waterbury was established by farming families who centered their community on the Congregational church. The Puritans had a deep aversion to the grandeur of Catholic and Episcopal churches, and instead gathered at the village Meeting House for worship on the Sabbath. Respect for the Sabbath was demanded of every person, including Native Americans, and stiff punishments were ordered for anyone profaning the Sabbath. 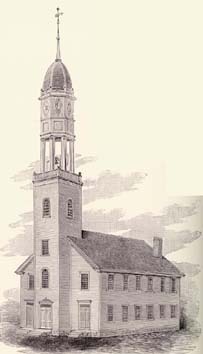 Financial support of the church and its minister were required of every resident, and the Congregational church was established as the official church in the Connecticut constitution until 1818. Seating in the Meeting House was organized according to status, with the most prominent citizens seated in the front. Many towns had a special section in the back of the meeting house designated for non-whites, but there is no record of this in Waterbury. Beginning in the 1730s, seating in the meeting house was organized with the ministers family in the pew closest to the pulpit, the towns elderly in the front, and general seating divided by gender until 1769, when husbands and wives were permitted to sit together. Seating was guaranteed for men over 16; this may indicate that children and African Americans were expected to stand in the back. A 1792 seating list does not include any African Americans. Connecticut families were expected to educate their children in the scriptures and pray daily, but full membership in the church was limited to those who had been baptized and taken the church covenant. In 1795, there were ninety-three members of the church. Mingo, who had once been enslaved by one of the churchs deacons, was the only African American member. Mingos name appears last in the alphabetical membership listing. The First Congregational church in Waterbury does not appear to have had more than one African American member at a time until the 1840s: Betty Brewster joined the church in 1817 and was the only African American until Emma Linsley joined in 1843. A third woman, Jennet Camp, joined in 1850. As late as 1853, the church specified that these women were colored in the membership listing. Prominent members of Waterburys Congregational Church were slave owners, including Rev. John Southmayd, Rev. Mark Leavenworth, and Deacons Thomas Clark, Joseph Hopkins and Stephen Bronson. It is likely that they required all members of their households, free or enslaved, to attend church regularly. Heads of families were obligated to raise their children to read the Bible and to have them baptized. This sense of obligation appears to have included their slaves as well as their children; two Waterbury Congregationalists had their children and their slaves, Comfort and Lucy, baptized as a group in 1801. The third house of worship constructed by Waterbury's Congregationalists in 1795 on the east end of the Green. It was used as a church until 1840, when a new church was built on the north side of the Green. Engraving published in Joseph Anderson,The Town and City of Waterbury, Volume I, 1896.